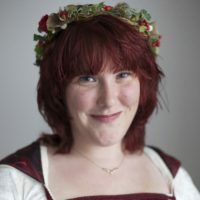 Katie Goode is the creative director of game studio Triangular Pixels. She has been described as a virtual reality pioneer who is pushing the technology forward to what it’s really capable of. What motivated you to join Triangular Pixels? Katie Goode: My husband and I founded Triangular Pixels back in 2014. We were not out to make a game studio, but were just wanting to make our own titles as we had creative urges and ideas that wouldn’t be fulfilled at the studios we were working for at the time. RV was moving quick, and we wanted to move quickly with it. We went to our day jobs, then we came home and worked. Eventually we couldn’t carry on at that pace, so moved out of London and started working just for our own company. You are a key member of the UK virtual reality community and have been described by The Guardian as a virtual reality pioneer. Tell us more about that. Goode: We’ve always been pushing VR gameplay to see what’s possible — introducing the concept of comfort options, local multiplayer with non-VR devices and companion apps, introducing redirection via level design and mixing VR and live theater. As for being part of the UKVR community, I’ve been heading to meet-ups and expos for a long time, sharing all that we’ve learned with workshops, panels and talks. I guess I’ve been around since the beginning of this modern generation of VR interest, so there aren’t many expos I head to where no one recognizes me now. I’m also helping out on the VRDevs Slack channel, where there’s nearly 1,000 VR devs from all over the world. Triangular Pixels won the 2016 Develop Games Industry Award. How are you leveraging on that to encourage more women to join the game development industry? Goode: I’ve also just won the Devon Venus Award for Inspirational Woman in STEM too! Being a public face for what we do really helps other women to see that there can be successful, leading, technical developers. I’ll often do interviews, shows and panels at open general public events, and are starting to head to some universities too. Winning awards means more people from different backgrounds get in touch with me to ask for my time, which allows me to attend those sort of events. Of course, there’s also the Women in Games Conference which I’ve done a workshop and panel for before. My email is always open for students from all walks of life to contact me. I wrote a piece about getting into games from doing a physics degree which has meant for the past few years I’ve been getting a steady supply of students wanting some help. Just a few minutes of my time answering questions can help their futures, so it’s worth it. What do you think are the major challenges that women in game development face? Goode: It depends where you are based in the world, which is a rather sad fact. Here in the UK, I can go to events and people respect what I have to say, and believe me when I say I’m a developer and I’ve worked on the game I’m discussing or showing. I feel comfortable here with how things are heading. However, in the USA, I’ve had horrible experiences showing off what we’ve done, with even other developers assuming I’m a booth babe, or that I’m probably just exaggerating. So the major challenge? Respect. What advice do you offer to girls and women interested in game design? Goode: Don’t be afraid to speak your mind and to share your feelings. Don’t let anything slip by you which you feel like is wrong. Stand up for yourself and others and challenge those involved. Don’t stereotype all men as some people do with women, everyone is different. And if you’re interested in game design, there’s no reason not to start designing today. Be it on paper, via mods for existing games, or via simpler game tools like GameMaker, or more complex engines like Unreal or Unity — just start making. Get playing too, both the good and bad always have something to teach us – and make sure to keep notes! You’ll start spotting the little things developers do that people don’t notice, and your work will improve too. Goode: We’re currently developing our VR title, Smash Hit Plunder, but we’re also keeping a look out for funding to allow us to develop our HTC Vive game, Unseen Diplomacy, further.